Museums and Galleries: The Vatican Museums, Roman Archaeological, the Capitoline Museums, the Museo Nazionale Romano and the Museo Nazionale di Villa Giulia, Palazzo Barberini, Galleria Borghese and Galleria Doria Pamphili. Classical Music: Academia di Santa Cecilia. Dance/Opera: Teatro Olimpico has the best reputation for dance. The Filarmonica is for ethnic and contemporary. Opera season runs from Nov-Mar at Teatro dell' Opera; in summer it moves outdoors [eg. Stadio Olimpico, Baths of Caracalla] and the prices come down. Theatre: Teatro Argentina, Teatro Valle, Teatro Vascello. Teatro Agora holds a short season of international theatre in other languages, while the Colosseo Ridotto presents English language shows every week. Live Music: The city's more in favour of jazz than rock with plenty of venues [eg. Fonclea, New Mississippi Jazz Club], or Latin music [El Charango, Open Gate]. Check 'Romac'e magazine or 'Time Out' for event info/listings. Ticket Office 'Orbis' is at Piazza Esquilino. While Rome’s cultural life has been hampered by the vagaries of political squabbling and its inhabitants’ lack of passion in the arts in the past, there has been an increasing desire to step out of the shadows and into the limelight. High-profile international dance and theatre festivals, such as the RomaEuropa Festival held in October, and Rome’s new state-of-the-art auditorium (see Music below) are all helping to make this happen. Rome’s one and only official arts centre, the Palazzo delle Esposizioni, Via Nazionale 194, which combines cinema with dance and exhibition spaces, is closed until early 2004. However, major exhibitions have a spectacular venue in the Scuderie Papali del Quirinale, renovated by famous Italian architect Gae Aulenti and located opposite the Quirinal Palace (tel: (06) 3996 7500; website:www.scuderiequirinale.it). Past shows have included one on the major works from St Petersburg’s Hermitage, Sandro Botticelli, and Rembrandt. Contemporary art or photography shows are also programmed. Those determined to sample something less conservative should seek out the Centri Sociali – non-profit, self-governing social centres set up by left-wing students during the 1970s, with support from the Italian Communist Party – which host the most radical concerts, films, theatre and dance events that Rome has to offer. Admission costs are at a minimum here, as are the prices for drinks at the bar. Centri Sociali attract an ‘alternative’ crowd aged 18-30 and vary from well-run places offering educational courses and Internet cafes to suburban squats. See Live music in Nightlife for more information. Tickets for cultural events are in demand and many are for subscribers only, so it is important for culture-keen visitors to rush to the box office with cash (not credit card) in hand some days prior to the performance. Price start at around €20. Ticket agencies may save hassle. Orbis, Piazza Esquilino 37 (tel: (06) 482 7403), provides tickets for concerts, theatre and sporting events. 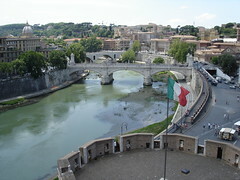 The weekly Roma C’è (website: www.romace.it) and Time Out Rome publications provide information on cultural events. Music: Rome has great plans for Renzo Piano’s new auditorium, which receives its official inauguration in December 2002. A ten-minute tram-ride from Piazza del Popolo, the auditorium or Parco della Musica (Music Park as it has been christened), features three halls with perfect acoustics and a large courtyard that will be used for outdoor concerts and events. The tourist information office can provide more information. In the meantime, the classical musical scene bases its reputation on two academies: the Accademia Nazionale di Santa Cecilia and the Accademia Filarmonica. Rome’s principal and most prestigious academy, the Accademia Nazionale di Santa Cecilia (tel: (06) 6880 1044; website:www.santacecilia.it) stages its own concerts or hosts visiting orchestras all year round at Auditorio Pio, Via della Conciliazione 4, while, during the summer, it graces the beautiful Renaissance courtyard of Villa Giulia, Piazzale di Villa Giulia 9, with performances. The Academia Filarmonica performs regular operas and concerts at the Teatro Olimpico, Piazza Gentile da Fabriano 17, Flaminio (tel: (06) 326 5991; website: www.teatroolimpico.it). Rossini and Verdi were once members of this academy (founded in 1821) that offers a varied programme of chamber music, opera and contemporary music. The Teatro dell’Opera di Roma, Via Beniamino Gigli 1 (tel: (06) 4816 0255; website:www.operaroma.it), dominates the opera scene. The season runs from November to May. The box office opens two days before each performance. Free concerts (choral, chamber and organ recitals) are held in churches – including Sant’Ignazio, San Giovanni de’ Fiorentini, San Giovanni and Santa Maria Maggiore – during the summer months. Theatre: The theatre season runs from October to May. The city’s official troop, the Teatro di Roma (tel: (06) 684 0001; website: www.teatrodiroma.net), is based at the prestigious Teatro Argentina, Largo di Torre Argentina 52 (tel: (06) 6880 4601), which hosts lavish productions directed by renowned directors. The Teatro Nazionale, Via del Viminale 51 (tel: (06) 485 498), is the permanent home of the Italian Theatre Board – ETI, which puts on light and fluffy comedies. Musical comedies are performed at the fashionable Teatro Sistina, Via Sistina 129 (tel: (06) 420 0711; website: www.ilsistina.com). Classical works are performed in the Teatro Valle, Via del Teatro Valle 23A (tel: (06) 6880 3794; website: www.teatrovalle.it), and in the ETI-owned Teatro Quirino, Via Marco Minghetti 1 (tel: (06) 679 4585; website: www.teatroquirino.it), whose varied programme includes the classics, contemporary work and Commedia dell’Arte. Fringe theatre is well represented at the Vascello, Via Giacinto Carini 72, Monteverde (tel: (06) 588 1021). Best of all are the open-air performances, held over summer in the lovely park, Giardino degli Aranci, Via di Santa Sabina, Aventino. Other venues are the Anfiteatro della Quercia del Tasso, Passeggiata del Gianicolo (tel: (06) 575 0827; website: www.anfiteatroquerciadeltasso.com), with stunning views over the city, and the Teatro Romano di Ostia Antica, the Roman amphitheatre in Ostia Antica. Information and booking numbers are advertised on posters. Dance: The Rome Opera Ballet performs at the Teatro dell’Opera di Roma, Via Beniamino Gigli (tel: (06) 481 601; website: www.operaroma.it), where the regular diet of classical ballet is enriched with guest performances of internationally renowned dancers. The Teatro Olimpico, Piazza Gentile da Fabriano 17, Flaminio (tel: (06) 326 5991; website: www.teatroolimpico.it), has a strong dance season, ranging from classical to contemporary. Tickets for dance productions at the Teatro Argentina, Largo di Torre Argentina 52 (tel: (06) 6880 4601; website: www.teatrodiroma.net), are snapped up, so early booking is advised. Film: Italy’s grand history in film has been centred in Rome since the Cinecittà (Cinema City), Via Tuscolana 1, was opened by Mussolini in 1937. Scenes from Anthony Minghella’s The English Patient (1996) and Jane Campion’s The Portrait of a Lady (1996) were filmed in these studios but Italian cinema has failed to match the flowering of the 1940s, 50s and 60s. Among the greats are Rossellini’s Open City (1946) and Vittorio De Sica’s The Bicycle Thief (1948), depicting a harsh but touching picture of post-war Rome. Equally popular but highly romanticised was Jean Negulesco’s Three Coins in the Fountain (1954), focusing on the quest for love and the Trevi Fountain, and Audrey Hepburn’s Oscar-winning performance as a besotted princess in Roman Holiday (1953). However, it is Fellini’s films – Roma (1972) and La Dolce Vita (1959) – that have indelibly stamped images of Rome on the movie-goer’s mind. More recently Rome’s version of Woody Allen, Nanni Moretti, enjoyed considerable success at home and abroad with a film called Caro Diario (1993), which showed a beautiful and virtually empty Rome in August. Rome is blessed with over 80 cinemas and their numbers are increasing all the time. Tickets cost about €7 (prices are often reduced for matinee performances and on Monday evenings). The three-screen Nuovo Pasquino, Piazza San Egidio 10, Trastevere (tel: (06) 580 3622), shows English-language films daily. Metropolitan, Via del Corso 7 (tel: (06) 3260 0500), and Warner Village Moderno, Piazza della Repubblica 45-46 (tel: (06) 477 791), dedicate one of their screens to English-language films. Films are also shown in their original language on Monday evening at Alcazar, Via Merry del Val 14 (tel: (06) 588 0099), while Nuovo Olimpia, Via in Lucina 16G (tel: (06) 686 1068), shows original-language films regularly. There are numerous open-air showings in the summer, including Cineporto, Viale Antonio di San Giuliano (tel: (06) 324 3903; website: www.cineporto.com), close to the Olympic Stadium, and Notti di Cinema a Piazza Vittorio (tel: (06) 445 1208; website: www.agisanec.lazio.it), which shows films daily in Piazza Vittorio Emanuele II in the months of July and August. Weekly showings and details of film festivals are set out in the weekly publication, Roma C’è (website: www.romace.it) or in the daily press. Cultural events: Each summer, from June to September, Estate Romana (website:www.estateromana.it) offers a lively schedule of outdoor cultural events around the city, from rock, ethnic and jazz concerts, through theatre performances and outdoor cinema, to dance lessons and other cultural events hosted in various Roman piazze and gardens all over town. As home to the Vatican, religious celebrations are important in Rome. The Pope makes an annual appearance at the Colosseum on Good Friday evening and delivers Midnight Mass at St Peter’s on Christmas Eve. There is nothing like Ovid’s Ars Amatoria (Art of Love – circa 16-25BC) for bringing Rome to life, with its vivid depiction of a trip to the Colosseum, the site of flirtation and grandiose spectacle. Those interested in political intrigue may turn to I Claudius and Claudius the God (1934), Robert Graves’ portrayal of ancient Rome, or the more measured tones of Gibbon’s History and Decline of the Roman Empire (1782). The dramatic poetry of Virgil’s Aeneid (19BC), evokes the glory of the Roman Empire, blessed and cursed by the Gods. The Romantics had a soft spot for Rome; indeed Rome is the place where Keats breathed his last and the Keats-Shelley Memorial House is situated here (see Key Attractions). The tragic tale of Beatrice Cenci, beheaded in 1599 outside Castel Sant’Angelo for plotting to kill the father who had raped her, inspired Shelley’s play The Cenci (1886).